It’s important for nonprofits to advocate on behalf of their causes and weigh in on important public policy issues and community challenges, but a recent development in the drama over former San Diego mayor Bob Filner shows that nonprofit leaders need to be careful about how it’s done and mindful of the rules and regulations governing nonprofit advocacy. The Voice of San Diego, a nonprofit reader-supported news organization based in that city, reported on Tara Jones, who leads the National Women Veterans Association of America (NWVAA). She made a dramatic about-face during the sexual harassment scandal that took down Filner’s mayoralty, going from leading a group set to celebrate his work at a big fundraiser to publicly calling for his resignation, including selling “Please Resign!” T-shirts on the organization’s website. “But in actively working to oust one man from his job, Jones may have stepped outside the bounds of her own as the leader of a tax-exempt charity,” reported the Voice, which went on to tell of a local grant-writing firm that severed ties with the NWVAA and filed three complaints with the California attorney general’s office, including one alleging that the veterans group violated federal law by engaging in overtly political acts aimed at removing Filner from office. As all nonprofit leaders should know, the Internal Revenue Code prohibits 501(c)(3) nonprofits from participating in efforts to elect or defeat a candidate for public office. 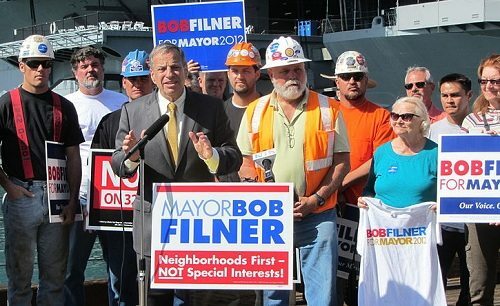 If there had been a recall, Filner would have been a candidate for his own office. The grant writer said she also plans to make a formal complaint to the IRS. Her complaints to the attorney general’s office say Jones violated state laws regulating the conduct of nonprofit executives, primarily rules regarding board meeting minutes and financial statements. One of NWVAA’s founding board members resigned over the incident. “Nothing illegal is going on over here,” Jones told the Voice. “We’ve already spoken to our attorneys pertaining to it.” There is disagreement over whether or not she represented herself as president of the NWVAA when participating in the recall efforts. Libby said that a leader of a nonprofit openly calling for the election or removal of a politician would blur the line between private opinion and the official position of the nonprofit, and that nonprofit executives are prohibited from any political activity aimed at a specific candidate. This would apply to both calls for resignation and participation in a recall campaign. Since the language of the 501(c)(3) section of the federal tax code focuses on candidates for office, the IRS might be hesitant to fault a nonprofit for urging the resignation of an already elected public official, Abby Levine, legal director of the Bolder Advocacy initiative for the Alliance for Justice, told the Voice. She said the rules about nonprofits participating in recalls are especially murky, although they clearly prohibit charities from endorsing a candidate who would succeed a politician who has been recalled. The NWVAA bills itself as an organization that serves the unique needs of female veterans, offering such services as affordable childcare, mental health services and assistance in speeding up Department of Veterans Affairs claims. As part of its filing for nonprofit status—as is typical—it said that it would not engage in any “substantial” political activity. Jones told the Voice that the NWVAA’s top priority now is to assist female veterans whom Filner allegedly harmed and to assist the San Diego County Sheriff’s Department in its investigation of him. Filner resigned as mayor on August 31 as part of a deal he struck with the City Council. An election to replace him is scheduled for later this fall. NWVAA’s former grant writer said that Jones “was totally unprepared and a no-show for numerous requests for any proof that they were actually doing what their web site said, [and] we realized that she is not running any programs at all,” claiming that the money being collected by the charity is being used for political activities, not programs for clients. She said that Jones demonstrated a lack of understanding about the IRS’s prohibition against political activity for 501(c)(3) nonprofits. Her admonishments to refrain from such activity were ignored, she told the news organization. The Voice reported that during the 2012 election cycle, Jones endorsed Filner on behalf of the NWVAA, saying he had “earned the right to be mayor.” After allegations surfaced that Filner had sexually harassed numerous women, including female veterans, Jones became a fixture in the media spotlight and said her organization would hold Filner accountable, eventually calling for his resignation.